An estimated 90-95 percent, about 20,000 greyhounds, are adopted each year. Greyhounds make terrific pets because they are gentle, tolerant and accustomed to human handling. Because they relate so well to humans, most greyhounds adapt quickly and easily to life with families, including those with small children. Most begin racing at about a year and a half, and continue to four years old. Some will race beyond their fifth birthday, and a select few past their sixth. Because they are generally well cared for and in excellent health, most greyhounds live to 12 years or older. Most adopted Greyhounds are housebroken from the start because, in their kennels, they are turned out four or more times daily to relieve themselves. Some may need to be taken outside more frequently at first, but they will adapt quickly to the schedule established in their new home. Greyhound males stand 26 to 30 inches tall at the shoulder, and weigh between 65 and 85 pounds. Females stand 23 to 26 inches tall at the shoulder, and weigh 50 to 65 pounds. Although the average greyhound consumes up to two pounds of food per day, they burn off excess weight when they run, so are naturally thin and carry little body fat. Because greyhounds have little body fat and a thin coat, they are not suited to live outdoors in extremely cold or hot weather. They prefer temperature-controlled environments and soft beds where they can feel safe and protected. Adoptees should know that greyhounds love to run, and a leash assures them protection from injury. Without a leash, they might run straight into traffic or hurt themselves in other ways. Because they are accustomed to being walked and exercised on a leash, greyhounds adapt well to this safety measure. In most communities, local ordinances require that dogs be kept on a leash when outdoors. For more information about adopting a retired Greyhound the American Greyhound Council funds a national telephone hot line operated by Greyhound Pets of America (1-800-366-1GPA), the nation's largest independent Greyhound adoption organization. The hotline is staffed by GPA volunteers, and provides information and referrals to those interested in Greyhound adoption. 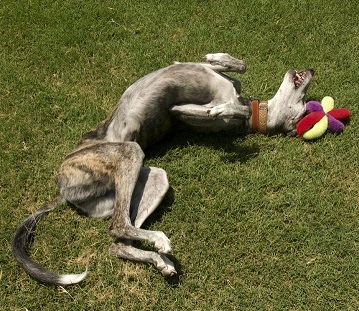 Greyhound Pets of American also has a wealth of information on its web page at www.greyhoundpets.org.